As we prepare to celebrate Independence Day tomorrow, we want to celebrate your dedication and support for the important work we do. You may have seen from the many articles on the Web recently that the American Association of Pediatrics has begun recommending that pediatricians encourage reading aloud to young children. That is the primary activity we have enjoyed doing together at Reading to Kids since 1999, and we extend our thanks to you for the inspiration you give hundreds of children each month! This morning the July 12th Reading Clubs are full, though we may have spots open up later today and over the next week. If you are signed up but know you can't join us, please click here to cancel as soon as possible so that someone else may take your place. 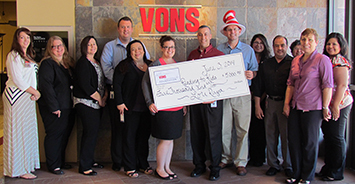 It is our pleasure to thank The Vons Foundation for its support of Reading to Kids, enabling us to share with children our love of reading! Their recent $5,000 grant will go towards purchasing the hundreds of books we donate to our seven partner schools' libraries each year, and to the thousands of books we give to participating kids each month. Our special thanks go to Reading to Kids volunteer Joe Morchy for sponsoring us for this donation through his employer. Please click on the photo above for a larger version of the check presentation from The Vons Foundation to Joe and Reading to Kids Managing Director Charlie Orchard. Thanks, and we wish you a very happy 4th of July weekend!